" Experience the Moringa "
raised growing international interest for this tree which originated from India. Vitamin A, which acts as a shield against eye disease, skin disease, heartailments, diarrhea, and many other diseases. Calcium, which builds strong bones and teeth, and helps prevent osteoporosis. Potassium, essential for the functioning of the brain and nerves. Proteins, the basic building blocks of all our body cells. Besides the leaves, the other part of Moringa tree has also a great features for various everyday uses.For instance,we have heard that India's ayurvedic medicine uses in Traditional Medicine to cure some diseases such as natural antibiotic, an aid in childbirth, for treating liver disorders and many other uses.It is also recorded that villagers in Oman use Moringa oil to treat stomach disorders.In Haiti,villagers boil Moringa flowers in water and drink the tea as a powerful cold remedy. Dried Moringa leaves treat diarrhea in Malawi, Africa. Moringa is also an important food source in many countries. In India, Moringa pods are widely consumed and plantations exist to produce pods for export ,fresh and tinned, to overseas consumers. In West Africa,Moringa oleifera leaves are commonly used to make sauces. Moringa stenopetala leaves are the staple food of the Konso people in Ethiopia. Studies have shown the leaves to be an excellent source of vitamins, minerals and protein: perhaps more than any other tropical vegetable. Many programs use Moringa leaves to fight against malnutrition and its associated diseases (blindness etc. ).It is considered as one of the most valuable and useful plants on the planet. 2) Moringa flocculent, unlike aluminium sulphate, is completely biodegradable.This aspect may be particularly interesting to developed countries. Several organisations have isolated the active polyelectrolyte to facilitate its use in water treatment plants as well as in algae farms and other industries using flocculation: wineries, paper manufactures, mines. Now that research and application at the pilot scale have been achieved, production and use of Moringa flocculent in real economic conditions is being developed. Oil extracted from the seeds is an excellent edible vegetable oil and is also useful within the cosmetics industry. A dual usage of Moringa, as a source of oil and flocculent, is possible, since the seed cake remaining after oil extraction retains the flocculating properties. Other potential applications of Moringa including use as livestock feed, plant growth hormone, green manure, medicines or for paper making are currently the subject of various research efforts. Scientifically speaking, Moringa sounds like magic. It can rebuild weak bones ,enrich anemic blood and enable a malnourished mother to nurse her starving baby. Ounce for ounce, it has the calcium of four glasses of milk, the VitaminC of seven oranges and the potassium of three bananas. Moringa is a remarkable discovery which can make a tremendous difference in your health and quality of life. Mounting scientific evidence shows what has been known for thousands of years by people in the tropical parts of the world :Moringa is natures medicine cabinet. It is best known as an excellent source of nutrition and a natural energy booster. Loaded with nutrients, vitamins and amino acids, it replenishes your body and provides what you need to get through a hectic weekday or active weekend. Yet this is not a sugar-based energy. Its not something which makes you hyper for some period of intense activity then leaves you drained. In fact, Moringa is also relaxing it helps to reduce blood pressure and assure a good nights sleep. And Moringa is loaded with nutrients. Each ounce of Moringa contains seven times the Vitamin C found in oranges, four times the Vitamin A of carrots,three times the iron of spinach, four times as much calcium as milk and three times the potassium of bananas. It's great for people of all ages, especially oldsters who are losing their alertness.Diabetes-An extract from the Moringa leaf has been shown to be effective in lowering blood sugar levels within 3 hours of ingestion. All Moringa products from Thai Herbal Group66 under "Pee JooK" brand registered are harvested and processed by hand, from naturally grown trees in an unpolluted environment. 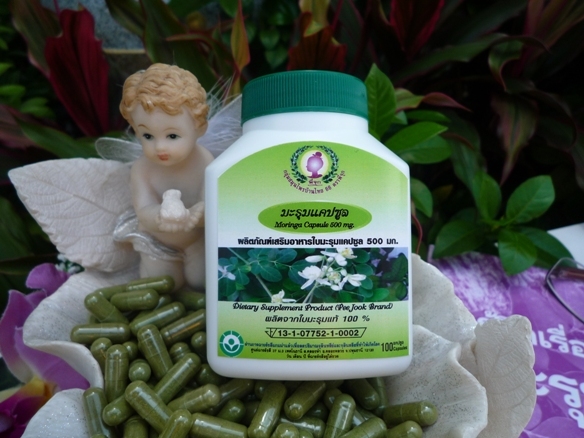 The products are carefully produced for instance ; during the natural drying process, the products are shadow dried and not exposed to direct sunlight and all the wonderful ingredients are dried in the most perfect way-naturally maintaining their full healing powers.All plants harvested and processed by Thai Herbal Group are known for their healing abilities and high nutrients.